Icons of Canadian Heavy Metal MESSIAH FORCE formed in Quebec in 1985. As 2017 marks the 30th anniversary of this legendary Power/Speed Metal release, No Remorse Records prepared a special anthology edition on a double CD. 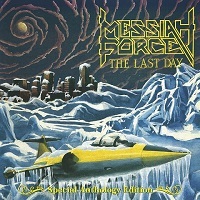 The first disc includes the original '87 album, and the second disc includes ten additional tracks: seven taken from the "Messiah Force" demo from 1987, and three taken from the "No Hideaway" demo from 1991. For review purposes, we’ll start with the “The Last Day” album and then get to the additional demos. The start to the album is fantastic. In “The Sequel,” we have piano and ominous keyboard notes, while the sounds of aircraft swirl in the background. The main riff is meaty, fast and a cross between Metal and Punk like the band MOTORHEAD. But when you consider the vocals, which are in the high tenor range, it’s Power/Speed Metal through and through. “Call from the Night” is more in the mid-tempo range, with a riff that moves stealthily, stalking you like prey. There are even some subtle Progressive elements here and boy that glittering guitar solo sure laid the foundation for the axe-masters in DRAGONFORCE. “Watch Out” is a smoldering track that really uses speed to push the sound. The riff is simple but effective in that regard. “White Night” opens with some thudding bass guitar and a mid-tempo groove, with a darker riff and sound overall, while “Spirit Killer” has some great percussion pyrotechnics and accented cymbal crashes that blow out your ears in every direction. “Silent Tyrant” reminds me of old school METALLICA in some ways; that opening sequence is regal and then it takes off like a jet plane careening above the clouds. “The Last Day” has a deeper sound, from lower chord progressions and a slow, deliberate pace that highlights the main riff. Renaud can really push into the high vocal range in a very clear manner. “The Third One” is the last track from the original full-length “The Last Day.” When you consider this album was as a demo in 1985, when the scene was just building at the time but had not yet reached full potential, you have to consider this album as landmark in that regard. The bonus three remaining tracks were from the 1991 demo, “No Hideaway.” Considering it was six years since the original demo, but released just before the Grunge movement wiped out most of Heavy Metal at the time, the demo stays true to their roots but also shows some growth in the band as songwriters. “Lesson for a Liar” brings this point to life. The riff is weighted and aggressive and the vocals are a little tighter. The bass guitar is well in the mix also, something that can often be missed. What a wonderful collection from this band. If you were not familiar with them at the time these songs were originally released, take a walk down in history and listen to how many bands that came after them were influenced by this sound. I don’t often like to look back when it comes to music, but this collection reminded me of why that is important to remember.